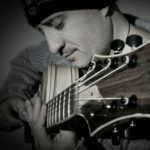 Brazilian jazz guitarist Genil Castro continues his exploration of artificial harmonics (inspired by the beautiful playing of guitar legend Lenny Breau) in this master class. In Part I, Genil taught us the most important aspects of this technique and the musical applications for it. Now in Part II, we get into the finer aspects of what Genil calls ‘electric lap piano’. Part of the Lenny Breau style artificial harmonics technique is the ability to play close voicings that would be usually almost impossible. The added challenge is to really understand the concept of plurality (how different voicings can have multiple applications) and the actual voicings that are created by adding an artificial harmonic as part of the chord. If you’ve checked Part I of this series, Part II is an essential continuation for the serious jazz guitarist. Together, both videos will give you a unique look into Genil’s take on these concepts and help you achieve these sounds on your guitar today! Fantastic class! I first became aware of his music some years ago through Youtube, and when I saw this class being offered, I jumped at it without hesitation, and I’m glad I did.